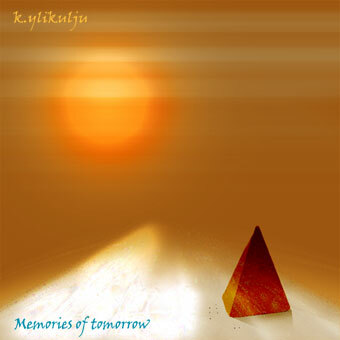 If you’ve been waiting for a second Clayderman from K.Ylikulju’s new ep you might be dissapointed because Memories Of Tomorrow is a three-track ambient ep so there’s no fast beats or raving basslines. Though, If you ask me this is as good as Clayderman, maybe even better: Memories Of Tomorrow has a clear melancholic theme and I’d say the soundscape is richer than on Clayderman. At is build on a pulsating sequence pad with layers of organ and a choir. Later on the heavily compressed drums come along still keeping the tune on it’s slow tempo melancholic way. At was released earlier this year on the Rikos Records Promo CD. Defeneately one of the best tunes on that compilation. At also builds on a sequence (like At) which plays more or less on the back ground for the whole song. A string pad and a bass line forms a perfect harmonic combination with the sequence and the fading-in piano loop really hits the spot. This is the best ambient track I’ve heard this year. As at and at are very similar to each other (the sequences and harmony combinations and all that) “chored” the track between them is more minimal – mainly played on strings and a sine bell of some kind. Still this track has a moving and memorable melody and fits on the album. All three tracks are great compositions and real masterpieces that will move you for sure. Only thing to critisize here is the album’s name which reminds me of Enya. Oh yeah, and as usual you can get this album on CD too. It even includes a 22 min bonus track (called Don’t listen) which more than doubles the running time. Just contact Kyösti below.